A little freshness for everyone. 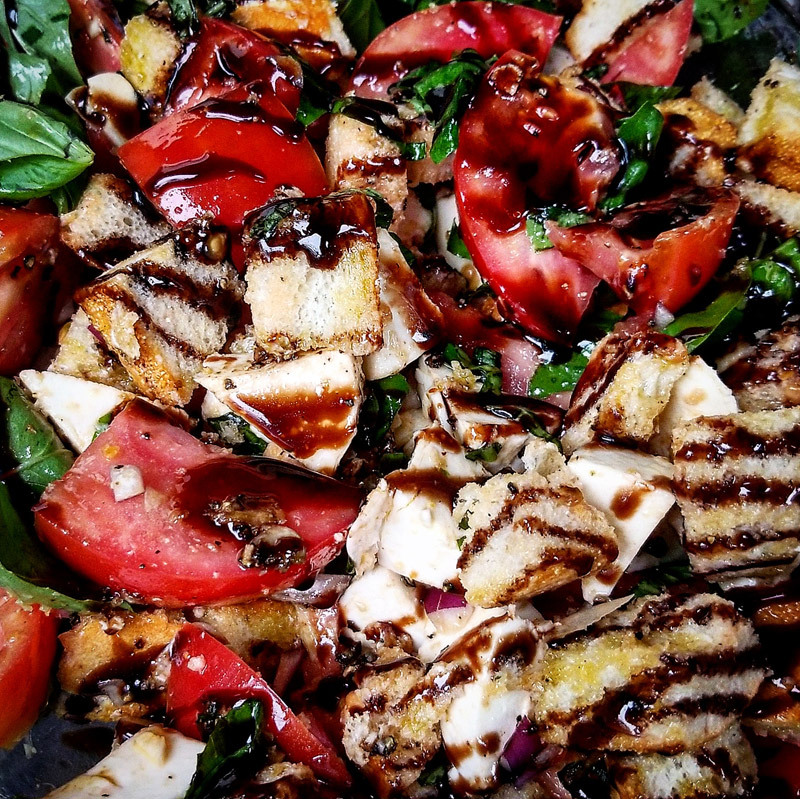 How about a some Italian Bread salad (Panzanella) for the side of tonights juicy steak? Slice the bread into 1-inch cubes: Slice or tear the bread into roughly 1-inch cubes. I usually leave the crusts on, but you can remove them if you prefer. You should have about 10 cups of bread. Dry the bread: Spread the bread cubes over a baking sheet. Leave uncovered overnight to stale and harden. Alternatively, bake in a 300°F oven until hardened on the outside but still slightly soft in the middle, 15 to 20 minutes, stirring once or twice during baking. Chop the tomatoes into bite-sized pieces. Slice the onion into thin slices and soak in a bowl of cold water for 10 to 15 minutes while assembling the rest of the salad. Make the vinaigrette: Combine the olive oil, garlic, red wine vinegar, salt, and fresh black pepper in a jar. Shake vigorously. Combine the salad in a bowl: Combine the bread and chopped tomato and fresh mozzarella a large mixing bowl. Pour the vinaigrette over top and use a spatula to thoroughly combine. Let the salad sit for 1/2 hour to 1 hour. Stir occasionally so the juices and vinaigrette are evenly distributed. Add basil and serve: Just before serving, stir in the basil. Finish with a drizzle of balsamic paste or reduction. This salad is best eaten the day it’s made.